This is the one I have been waiting for! Forget all the other ones (even KamiNomi III), Gin no Saji has been the anime I’ve wanted ever since I started the manga. And now it’s confirmed! Hiromu Arakawa started Gin no Saji in April 2011. That’s a little under two years ago, which is a short time for any manga to run before it gets an anime adaptation announcement. True as it may be, this manga was popular from day one. It sold 90,000 copies in just 3 days for its first volume, became Shogakukan’s fastest manga to reach the 1 million printing and now it comfortably ranks in the top 5 during the opening week of the each volume. Not only has it enjoyed commercial success but it’s also gained critical acclaim. With a Manga Taisho Award under its belt and being named Da Vinci Magazine’s #1 manga (aimed at men) of the year, Gin no Saji is pleasing everyone. Yet another win for Hiromu Arakawa, the female mangaka with golden touch when it comes to shonen manga. Arakawa gained commercial and critical acclaim for the monster hit Fullmetal Alchemist, and her luck seems to be repeating itself. Sure Gin no Saji isn’t at a FMA level of fame, but it too is successful. Get excited people! 2013 got even more epic, which is almost impossible at this point. 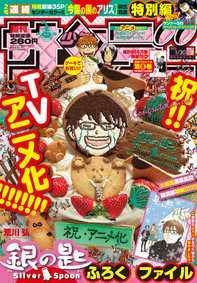 Gin no Saji is brilliant, very happy with this announcement.